In the month of February, 1848, the Twelve Apostles met at Hyde Park, Pottawattamie County, Iowa, where a small branch of the Church was established. .. We were in prayer and council, communing together; and what took place on that occasion? The voice of God came from on high and spake to the Council. Every latent feeling was aroused, and every heart melted. What did it say to us? ‘Let my servant Brigham step forth and receive the full power of the presiding Priesthood in my Church and Kingdom.’ This was the voice of the Almighty unto us at Council Bluffs. . . .
Journal of Discourses, 8: 234. It is worth noting that Myrtle Hyde puts the date of the revelation in Orson Hyde’s modest home to December 5, 1847. She writes, “Sunday, December 5, 1847, the eight men arrived in Hyde Park, breath of men and horses forming clouds in the frosty air… At dusk, five o’clock, the meeting began. The fire received Orson’s regular attention, warmth emanating from the blazing wood in front of the large backlog in the fireplace. The nearness of the cabin walls enhanced the feelings of unity in the small room. 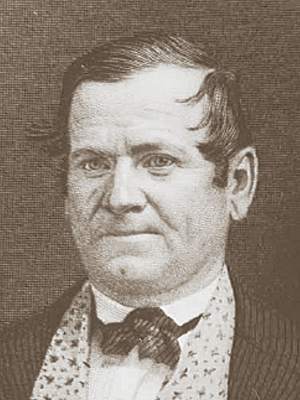 Brigham Young, president of the Quorum of the Twelve, disclosed that the need for a Presidency of the Church “lies with weight upon my mind,” adding, “I have been stirred up to do this by the Spirit of the Lord.” He asked the other apostles to tell their feelings upon the subject. In turn, Heber C. Kimball, Orson Hyde, Orson Pratt, Willard Richards, Wilford Woodruff, George A. Smith, Amasa Lyman, and Ezra T. Benson manifested sincere opinions. They conversed more, and they prayed, a sublime outpouring of the Holy Spirit assuring the nine companions of Heaven’s acceptance of their efforts. Absorbed with the enveloping peace in the room, Orson looked upward in sudden astonishment when he heard a rich encompassing voice. The sound originated somewhere beyond and above the circle of the brethren. Quickened to the center of his soul, Orson knew the source: “The voice of God came from on high, and spake to the Council.” The words were brief, the message direct: “Let my servant Brigham step forth and receive the full power of the presiding Priesthood in my Church and kingdom.” (Myrtle Hyde, Orson Hyde: The Olive Branch of Israel, p. 221). Robert G. Cleland and Juanita Brooks, eds., A Mormon Chronicle: The Diaries of John D. Lee 1848-1876 (Salt Lake City: University of Utah Press, 1983), 1:278; cf. Matthew 3:17; John 12:29; Revelation 14:2; 2 Samuel 22:14; Job 37:5. This entry was posted in Pioneer stories, Priesthood, Prophets, Receiving Revelation, Stories from Church History and tagged Brigham Young, First Presidency, Hyde Park revelation, Orson Hyde. Bookmark the permalink.